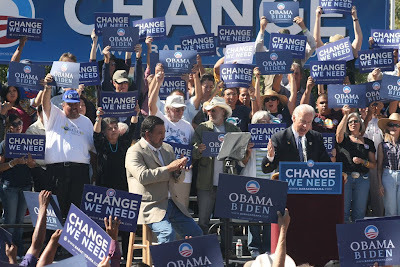 Joe Biden stopped by Old Mesilla on October 17. I received word of his visit a few days in advance and was a bit excited. I mean, all I do is watch cable news and read political blogs all day so I've heard everyone's stump speech before. Still, I wanted to see him and show my support. I see the massive crowds that Obama and to a lesser extent McCain and Palin get and I hear stories about the excitement volunteers and about the protests and general craziness surrounding everything. I wanted to see it for myself. I decided against going to class because I wanted to get there when the "doors opened" at 11:30. Of course I actually headed out on my twelve minute journey to Mesilla at a little before 11:30. Driving down the street a few miles away there were no Obama/Biden signs, but there were McCain/Palin ones dotting the place. That worries me. But when I finally got to Avenida de Mesilla I was pleased to see that parking was hard to come by. I ended up parking in a dirt lot and proceeded to walk to the Plaza. I figured a couple of friends would end up coming too, but they had better things to do, I guess. That is sort of emblematic of this area. Anyway, I walked for about eight minutes alongside mothers with their children, retired couples and the occasional college student. We made our way to the Plaza and there were a couple of lines, one for people with tickets and one for people without tickets. I sat on the curb in front of the San Albino Basilica. It is a beautiful church. 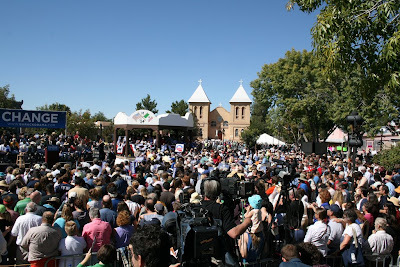 As a Catholic and a fan of old churches it made me happy that this was the backdrop of the rally. In the little yard in front of the church is a memorial for all unborn babies. More on this later. After sitting for awhile I decided to stand in line to get in. When the gates opened thirty minutes late the line moved relatively quickly and, having no weapons or signs (you couldn't even get in with pro-Obama signs), I got into the open air rally site with a decent selection of places from which to watch. When I went to SXSW I learned to take a spot in the back of the line at least one band before the one you came to see. As the people in front leave because they're tired or already saw what they wanted to see, you get to move up and get to the front. So, naturally, I did this here too. I started off about fifteen yards away, directly in front of the podium. Slowly I moved up. The heat really began to get to people. Even with the sun pounding down on us, we stood in good spirits and waited. Volunteers passed out water bottles, but I let the older people take the first pick. Over the PA system they played Tom Petty (yes! ), Stevie Wonder (yes! ), U2 (ugh) and John Mellencamp's "Small Town." That song was a single off of "Scarecrow;" the title track of which was recorded the day I was born. When a man near me asked nobody in particular who the song playing was, I wanted to start telling him all I know about the song, like how it is one of my five favorite of all time, but I stayed silent. A fair amount of middle and high school kids stood waiting with their parents. I expected more college students, but the ones there were mostly the people already volunteering. 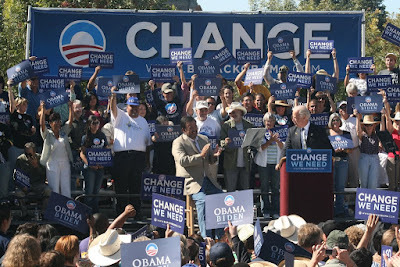 Even some kids from San Antonio had taken a bus to New Mexico to canvass that day! They were the most excited of everyone. The next most enthusiastic group was the older people. Next to me stood two older ladies who spent the hours we stood there talking about the recent debate and criticizing McCain and, especially, Palin. They were nice ladies who moved to Las Cruces from out east to retire. 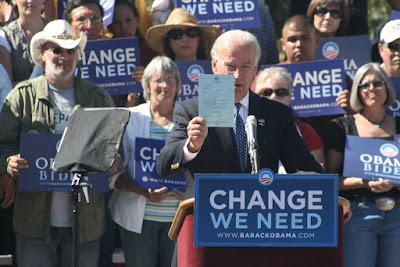 But the sun got to one of them (boy, it was unusually hot) and they had to leave to the shade before Biden spoke. The wind knocked down the "Change" sign that would stand behind the speakers and look oh so pretty on t.v. Bad omen? Maybe. But, later, white birds that I have never seen before began flying over us. Then more flew over. Then more. So I think that offset whatever omen the wind had brought. 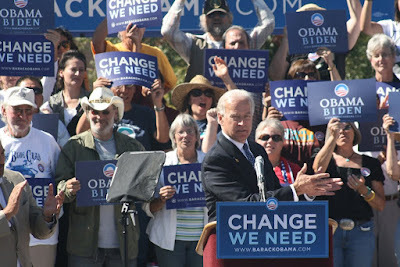 Finally they gave us the Obama/Biden signs you see at every rally on the news. Immediately every single one was raised in the air...as a shield from the sun. And then people began to speak! Tom Udall's wife, Harry Teague, some local people, a young girl from the Las Cruces Obama office and Governor Bill Richardson all spoke. Richardson, of course, was the most charismatic and funny. Then Biden came out firing. He gave his stump speech like I've heard so many times before. Then he introduced something new that he would bring up in subsequent speeches. Apparently, Sarah Palin had called the rural, small town places that she visits the patriotic parts of America. All of us Democrats have heard this for years. We are not patriotic because we oppose going into Iraq or lowering taxes on super rich people or ending the so-called "death tax" on the same super rich people or for not blindly supporting everything stupid, bellicose thing George W. Bush says. Over and over they bludgeon us with this charge. And it forces many people to stay silent. 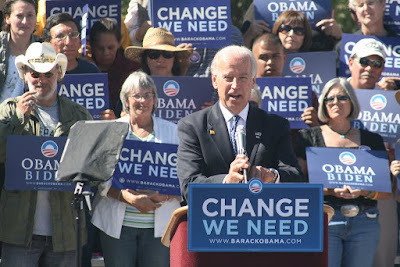 So Biden, on stage, squinting into the sun, says, "I'm TIRED, TIRED, TIRED, of being called unpatriotic! We are all Americans! We are all patriotic! No part of the country is more patriotic than any other!" That being just what I've been yelling at my t.v., albeit to zero effect, for years drew a huge cheer from me. And it drew a huge cheer from the crowd. Early voting was another of his major points. He had a blue card we could fill out. The volunteers had passed them out while we were waiting in line earlier in the day. By most accounts the Obama campaign is pushing early voting especially hard and is seeing some positive effects. 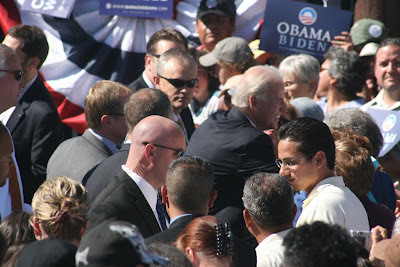 Afterward I tried to shake Biden's hand, but the crowd stretched just far enough that I could not get to him. The secret service, who must all be about 6 foot 5 inches tall, do a great job of shadowing him from different directions. I don't know how they survived all day in the sun in those black suits though. I walked back to the front of the church in time to watch a small group of college-age kids with pro-McCain signs start yelling at the Obama college-age kids. They each did their chants and the McCain protesters, vastly outnumbered, were shouted down repeatedly. I wonder what they thought they would accomplish? The real protesters were the Catholic anti-abortion people yelling at us about the evils of abortion. Since they were just standing there being ignored, I decided to buy an Obama button. I asked the lady how much each thing was in what I figured would be descending order of price until she hit one I could afford. I bought a plain blue one dollar button. Thanks a lot "Not Having a Job." Suddenly the abortion people became more aggressive because the leaving crowd began engaging them. Police positioned themselves between the crowd arguing about abortion and the crowd yelling their candidates slogans. The anti-abortion people had big signs, about four feet tall, of aborted babies. The protesters children held up these truly gruesome signs. Other signs read "I Regret My Abortion" and "You Can't Be Catholic and Pro-Choice." I watched people argue for about half an hour without getting anywhere, using bad examples and making generalizations about one another that they should not have been making. Eventually I just wanted to have an intelligent conversation and it seemed neither side was interested in having any of that. Suddenly one of the few men protesting decided to talk to me. We did not even well at each other. It was amazing. When he found out I was a journalism major he asked what they taught us about what stories to choose. He said the news did not cover the pro-life movement. I told him I found it hard to believe because I saw those stories periodically, but that they mostly taught us how to gather information and put together a story and the media usually picked stories that would get the organization viewers/readers/etc. After talking for another half-an-hour, the protesting wound down and they huddled together to talk so I left. Upon returning home I realized I had been sunburned. It was about four and I had not even thought about taking a hat or wearing a collared shirt, an unfortunate decision indeed. Now, if only Barack Obama himself would come down here for an open rally like he has done in Albuquerque, Española and Denver. 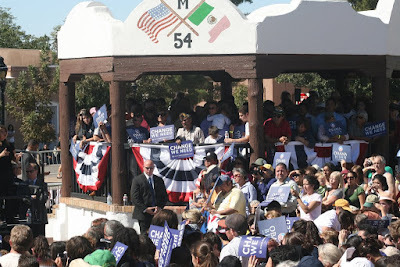 This article presents a good rundown of the Obama Española rally: Barack Obama Held a Rally in my Front Yard! Note: All of the pictures presented here are from Barack Obama's flickr account.